At its quarterly public meeting Wednesday, the Defense Innovation Board gifted the Pentagon with a new system to expose agile malarkey. Specifically, the board wants to help military executives and software procurement officials recognize when a software development project is truly using the recommended agile development process and when it is simply a traditional project dressed up in hip language. It also includes an overview of some of the popular tools currently used in agile development and a number of questions leaders can ask programming teams and management that may reveal what is (or isn’t) really going on. For example, leaders could ask program management “what have you learned in your past three sprint cycles and what did you do about it?” If the management answers “What’s a sprint cycle?” that’s probably not a good sign. 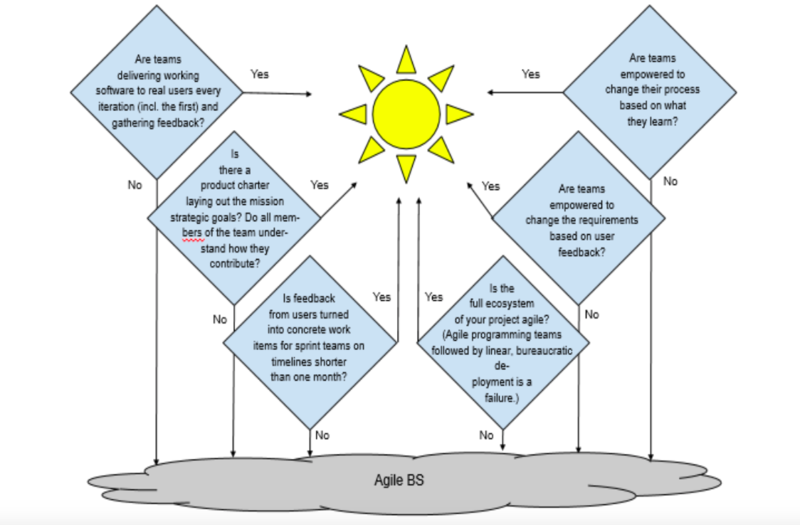 The document also includes a kind of graphical flow chart for separating agile from agile BS. “Are teams delivering working software to real users every iteration (incl. the first) and gathering feedback?” one square in the chart asks? If yes — congratulations, you’ve got agile! If not, well, you could be dealing with some BS. “We hope that this will be useful as people who maybe aren’t familiar with that kind of say well what should I be asking to make sure that the people who are working on the software for me, whether those are contractors or people within the government or servicemen and women — are we really doing agile or not,” Murray added.